To protect the power house from floods during construction steel channels were driven into the ground around the construction site. 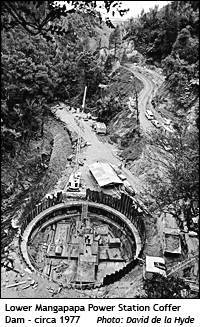 When the penstock tubes were installed the coffer dam was extended to protect them. On the left hand side of the power house can be seen a natural waterfall. The outlets of the twin turbines are positioned below the two lifting structures in the foreground. 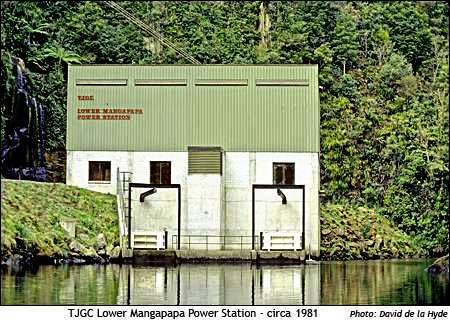 "Work on Lower Mangapapa Station commenced in 1976, the station being commissioned in April, 1979. 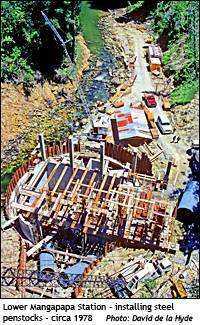 This scheme consists of a 27 metre high concrete arch dam in a narrow ignimbrite gorge about 500 metres upstream of Lake McLaren. 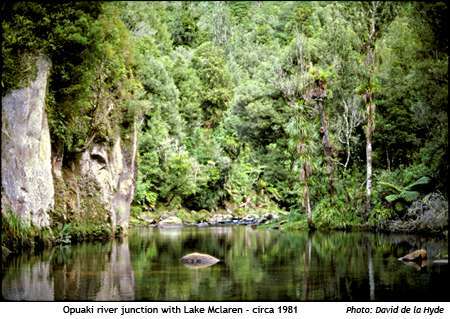 Lake Mangapapa extends as far as the tailrace of Lloyd Mandeno Station and has an area of approximately 17 hectares. A 3 metre diameter concrete-lined tunnel 400 metres long leads from an intake and access shaft structure to the power station through a bifurcated steel penstock which supplies two horizontally mounted turbines with a centrally mounted induction generator. 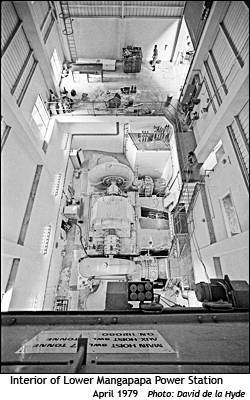 At the time of completion it was believed to be the largest induction generator in the world. The generating head is approximately 32 metres and the output about 17GWh per year. The total cost of this scheme was approximately $6,804,000."